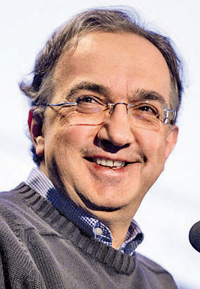 Marchionne: “It is possible that we'll go over the 50 percent mark if Chrysler decides to go to the markets in 2011." TURIN, Italy -- Fiat S.p.A. has enough cash to boost its stake in Chrysler Group to 51 percent by the end of this year, CEO Sergio Marchionne said. On a call with analysts on Thursday, Marchionne said Fiat has “an abundant cash cushion” that would allow Fiat to fund this year's investments as well as exercise an option to purchase an additional 16 percent of the U.S. automaker. Earlier this month Marchionne, who leads both automakers, indicated that Fiat is on track to lift its share in Chrysler to 35 percent this year from the current 25 percent. Fiat on Thursday reported it had 15.9 billion euros ($21.8 billion) in cash at the end of last year, 28 percent more than a year earlier. Analysts estimate Fiat may pay between $900 million to $4.4 billion for the 16 percent. Fiat raised its Chrysler holdings to 25 percent from 20 percent this month after the U.S. automaker won approval to build fuel-efficient engines in Dundee, Michigan. That was one of three conditions tied to the deal with the federal government that allowed Fiat to rescue Chrysler from a U.S. steered bankruptcy in 2009. The second test requires Chrysler to record a total of $1.5 billion in sales outside North America and to obtain agreements from 90 percent of its dealers in Latin America to carry Chrysler products. The third requires the development of a compact car on a Fiat platform that will achieve 40 mpg. Marchionne has said he expects all those requirements to be met this year. From there, Fiat has an option to boost the holding to 51 percent -- but only after Chrysler repays U.S. and Canadian government bailout loans. “It is possible that we'll go over the 50 percent mark if Chrysler decides to go to the markets in 2011,” Marchionne, 58, said this month at the Detroit show, referring to an initial public offering. Marchionne also said Chrysler had met with Goldman Sachs and other banks about raising new financing that would pay back in 2011 about $7.5 billion in bailout debt owed to the United States and Canada. Fiat may pay $900 million to $1.7 billion for the 16 percent stake before a Chrysler IPO while the same stake could be worth between $1.9 billion and $4.4 billion after the listing, according to Philippe Houchois, a London-based analyst at UBS AG. Fiat said today that fourth-quarter earnings before interest, taxes and one-time items -- which Fiat calls trading profit -- rose 26 percent to 615 million euros.